There are plenty of EQ plugins on the market, so any new ones really have to 'cut through the mix' if they're going to be successful. OverTone DSP's new one claims a different way of applying EQ that doesn't cause the usual 'digital' side effects. AF2-10 gives you ten bands, including low- and high-pass, low- and high shelves, and various band choices in between. There's also a spectrum analyser underneath, selectable to monitor either before or after the EQ is applied; and the spectrum can roll-off at 3dB per octave to better match the perceived signal. 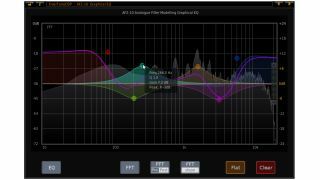 According to OverTone DSP, to deal with the problems behind digital filters (especially at lower sample rates), developers often make compromises in terms of latency and CPU. AF2-10 supposedly operates without these problems, with a true analogue-style frequency response. It's £22.50 (until January) at the OverTone DSP website. Currently, it's only available as a VST (for Mac/Windows/Linux), but an AU version is in the pipeline.